Recep Tayyip Erdogan sat in stony silence as he listened to the complaints of his citizens. During his final drive for votes ahead of tomorrow's elections, the Turkish president agreed to go on a radio call-in show, where the host nervously played recordings of people's gripes. The callers raised bread-and-butter issues that any democratic politician might expect to face - hospital waiting times, school exams, small business regulations - but Mr Erdogan's face darkened as he answered. "The things that they have said are not true," he said. "They haven't said these things after serious examinations and because of that I reject them." 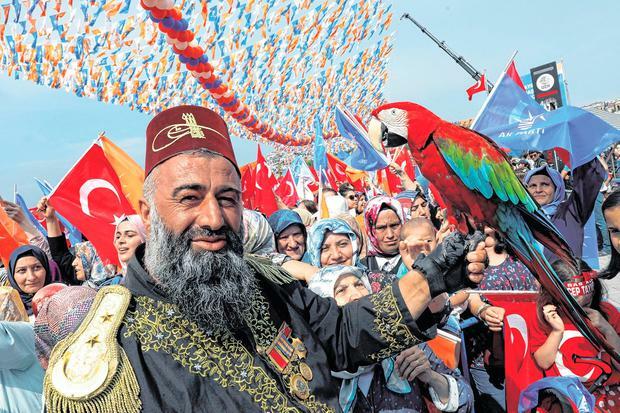 Fifteen years after Mr Erdogan first took over as prime minister, he is on the cusp of a win under a new constitutional framework that would make him more powerful than ever. Thanks to a controversial referendum he pushed through last year, Mr Erdogan would become the country's first executive president, with sweeping authorities to pass laws by decree and exert control over the judiciary. To critics, Mr Erdogan's power is growing at a time when he is angrier and more erratic than ever. He refuses to accept even mild criticism of his rule, is cut off from Turkey's economic reality, and blames unseen enemies for his country's problems. His unpredictable anger has been most sharply on display in his recent struggle against rising inflation. Mr Erdogan has lashed out against a shadowy international "interest rate lobby", which he says is determined to strangle Turkey's economic growth. He has even hinted he might seize control of the country's central bank. The comments have alarmed foreign investors. Mr Erdogan has long believed that he is struggling against entrenched foreign and domestic interests. That belief went into overdrive after the failed 2016 coup against him. But Turkey remains a member of Nato and a key strategic player in the Middle East, meaning Western governments have no choice but to work with him.